There is something so comforting about picking up a Nevil Shute book. Not a cosy-tea-by-the-fire sort of comfort but a reassuring sort of comfort nonetheless. You know you are in the hands of a consummate storyteller who will keep you enthralled from the first page to the last and that the book will be finished all too quickly. That is exactly what happened to me this week when I read Ruined City (also published as Kindling). The story opens in London in 1934. The Depression is raging and people are out of work all over the country but life for banker Henry Warren is going well. Sort of. Warren is spending more time on airplanes flying to business meeting than he is at home; he and his wife are divorcing; and, though only in his early forties, his health is beginning to fail. His business – a family one – is doing well but that’s about the only thing poor Warren has going right for him. Warren’s busy life comes to an abrupt standstill when, while in the north of England, he becomes ill. Forced to remain in hospital for some weeks after an operation, he witnesses firsthand the impact of the Depression on the residents of Staples, a former shipbuilding town. With the shipyard now closed and no other industry to support it, the town is a bleak and hopeless place. As Warren watches one after another of his fellow hospital patients die needlessly, too malnourished and weak to stand the shock of the surgery or attempt a recovery, an idea begins to form in his mind. And so, once recovered and on his feet, he vows to do something to help the town that had helped him. Shute had fun with the business details here. Not as much fun as he has with engineering details in his other books (once an engineer, always an engineer) but fun nonetheless. Warren is determined to help the people of Staples but to get a shipyard back on its feet you must first find someone who needs ships. Warren’s ethically dubious dealings with a fictitious Balkan country were the highlight of the book for me. Yes, the rebirth of Staples was all very cheering but give me greedy bureaucrats and crafty middlemen any day. Warren is an idealistic but he is no prim Dudley Do-Right; his heart is in the right place but he is experienced in the ways of the world – perhaps too experienced. He wants Staples to be successful and knows that to do everything completely above board right from the start would lead nowhere. No, to succeed wheels must be greased, pockets must be lined, and, crucially, a few lies must be told. It is all for the greater good but it is also not strictly legal. I wish I belonged to a mostly male book club so we could read Nevil Shute novels all the time and talk about what excellent manly virtues his heroes exhibit. We could sip our whiskey/port/other suitably manly beverage and toss off comments like “but Warren never lost his dignity” and “he sacrificed himself to save an entire town” and then get slightly teary and sentimental and it would all be wonderful. Since I don’t, let us pause for a moment to imagine how pleasant that would be. Eventually, all ends well (not always a given with Shute – see On the Beach). Warren bears his trials like a man (my imaginary book club applauds him for this, naturally) and ends up not only with the thanks of a grateful town but also a very steady, loyal fiancée. It is excessively tidy and, if lacking the slightly giddy energy with which Warren’s financial weavings were recorded, no worse off for all that. A fine sort of book. Now pass the port. I am a Neville Shute fan too. My fav is A Town Like Alice! That’s my favourite, too. Such a fantastic book. That’s another book on my ‘after the TBR dare’ list! I hope you enjoy then, Jane. For now, good luck with the dare! Oh man, that was a brutal way to kill off a wildly unimportant character. Building up his nice little back story, making the reader think out how nice his afternoon will be with the maid, and then WHAM! There’s a pale romance too, isn’t there? But what I remember is the town and the sharp dealing. I could read it again — and my heart rises at the thought. There’s something inherently cheering about the Shute universe. It may be the idea of getting the job done, and trusting that it will be successfully done by the end of the book. Feminine sentimentality doesn’t do half as much for me as masculine sentimentality, which melts me instantly. The romance is quite pale but it’s there. And I think you’re right about what makes Shute’s books so satisfying, that “idea of getting the job done”. Very satisfying when things are neatly tidied up. I’m not familiar with this book (I thought I knew all of Shute’s works). It sounds like a variation on (or a dress rehearsal for?) A Town LIke Alice, where Jean Paget uses her inheritance to develop the desolate outback town Willstown into a bonza place like Alice Springs. You know, I’d never thought of it as preparation for that section of A Town Like Alice but there are definitely similarities. I was going to say something similar to Susan above. The description reminds me of the Australian section of A Town Like Alice. Also, hee! regarding your description of the male book club extolling the manly virtues. Christy, there are definite similarities to A Town Like Alice though they honestly didn’t occur to me while I was reading. I was having to much fun reading about Warren’s dealings with shifty Slavs to notice, I guess. I love your picture of the manly book club! I do appreciate that Nevil Shute has enough interesting women to keep the books in balance, at least for me. I really enjoyed this one, and like other people have noted I saw similarities with A Town Like Alice – far and away my favorite. Personally, I’m not sure any of Shute’s female characters are all that credible. But they serve their purpose(s) and that’s good enough for me. So far my favorite Nevil Shute book is Pastoral, about a British RAF pilot. I’ve not read this book and will have to track it down. I was able to buy several of his when my library discarded most of his works except On the Beach. My library also had his books carefully catalogued under F N. Someone had penciled in “Norway” as his real last name. I read Pastoral for the first time last year and quite enjoyed it. I think A Town Like Alice will always be my favourite of his books but I’ve enjoyed every one I’ve read so far. I love Nevil Shute! I remember his characters long after as if they were my dear friends. My first was A Town Like Alice which is still a favorite. I agree with jemilyea that Pastoral is such a good book. It is a simple, fresh, delightful love story yet exciting too. I enjoyed it both in book and audible. I still reread it and lend this book out. A.J. Cronin is another author that develops his characters really well. Enjoyed this post and did not know about this book. I will try to find it and read it! I do mean to read A.J. Cronin one day…but I’ve meant that for five or six years now and still haven’t cracked any of his books. Still, I know the day will come. Do read The Citadel by a.j. Cronin. Years ago masterpiece theatre did a dramatization of it that was very well done. Of course the book is even better! I have very fond memories of the movie (with Robert Donat and Rosalind Russell), so I’m somewhat familiar with the story, but do want to read the book eventually. And then, after that, perhaps track down the miniseries. What fun to find so much Nevil Shute talk in one place. I enjoyed reading Kindling a year or two ago. And I love Jo’s phrase “pale romance” that’s a perfect way of describing it and Shute always deliver in that category. Romance’s founded on virtue and can do attitude. A Town Like Alice is probably my favourite too, but Pied Piper (elderly gentleman shepherds a group of children out of Europe at the beginning of the second world war) runs a very close second. Nevil Shute…what a pleasure. Like others I LOVE A Town Like Alice (even bought a DVD of the BBC production which was not easy to find). Pied Piper is my #2 and if followed by Most Secret. I read a number of the novels in the 70’s as my local library had quite a selection. I should check some of them out again. Just looked up a list of books. That “second Favorite” is Landfall, rather than Most Secret. Checked out Pastoral from the library. And thinking about starting my own “20th Century list”. I used to read Nevil Shute when I was doing my engineering 50 years ago. 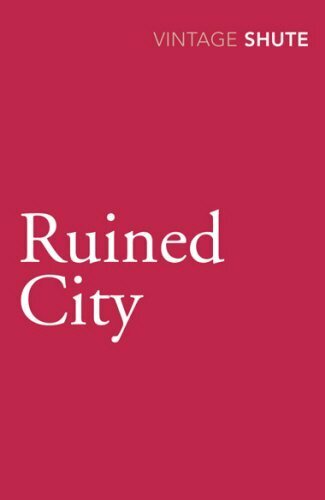 Ruined City was my first Nevil Shute novel. I am now trying to read them again. Landfall is one of my favorites along with Most Secret.